Can you recognize and tell the difference between gifted and talented children? Do you know how to provide the support they need? Responding directly to current thinking in education, this book raises practitioners’ expectations, and shows you how to identify children in your class as gifted and talented. 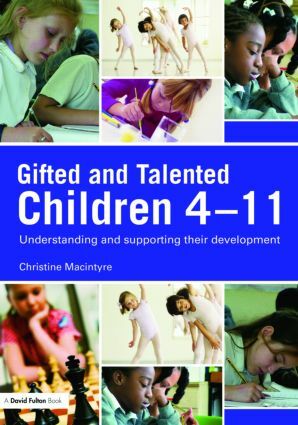 Christine Macintyre addresses the nature/nurture debate in relation to gifted and talented children, and discusses related topics such as the norms of development and domains of learning. A chapter on neurological development is included to confront questions such as "what is it that enables children to do well", and even "Is there a gene for genius?" Contrasting and conflicting answers are shared and debated. Finally, the issue of gifted and talented children with a learning difference/disability is raised and examples are given of how this ASD (asynchronous development) can hinder the recognition of gifts and talents in these children.